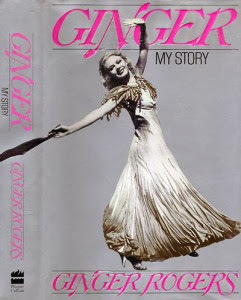 A Classic Movie Blog: My Movie Book Library: Did Ginger Rogers Really Sign My Copy of Her Autobiography? My Movie Book Library: Did Ginger Rogers Really Sign My Copy of Her Autobiography? Similar, but not too similar. I can see how I could have the real thing. Should I bother to find out? Do you have any books or memorabilia signed by classic stars? Have you ever had an appraisal done to determine if a signature is real? I have a baseball signed by the world champion 1929 Philadelphia Athletics -- an heirloom from my father-in-law. The appraiser said Lefty Grove's name was a stamp (he was a Hall of Fame pitcher, but a prickly s.o.b. ), but the rest were genuine. Yeah, I feel that way about all my books. I've got a bunch of my Dad's old records too, and they might be worth something, though they are pretty beat up. I'd never get rid of them though. That was big part of my childhood! That's sounds like one amazing baseball. How fascinating to know the detail about the stamp. That dude was prickly--sheesh! I think the fact that it was sent by the studio is still sort of exciting, though yes, not as exciting as it would have been if Cagney signed it. Sometimes I think it's more fun to keep the fantasy alive and just imagine it's real too! 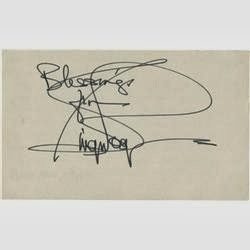 I've had a little more input on the Rogers signature, and I'm pretty sure it is real, but since I have no plans to sell it, I figured there's no need to find out for certain.